The Andrew Simpson Sailing Foundation has awarded Dalgety Bay Sailing Club in Dunfermline, Scotland a grant of four thousand six hundred and twenty pounds to be spent over the next two years. The presentation was made to 4 of the 6 young volunteers that will benefiting from the money, by ASSF Ambassador and Olympic Silver Medalist, Luke Patience. 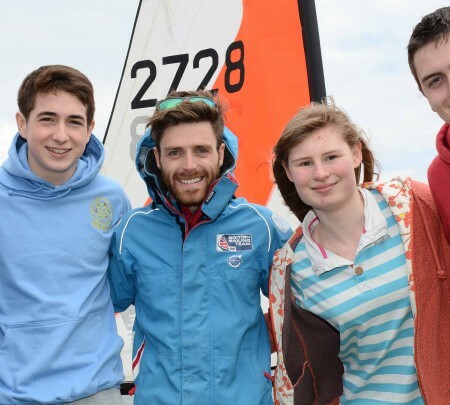 The money granted will be used to train volunteers to gain Royal Yachting Association (RYA) Instructor and Coach sailing qualifications, increasing the number of dinghy sailing instructors, senior sailing instructors and level 2 race coaches within the club. These staff will then be able to support weekly sail training sessions offered to children and young people aged seven and above, from beginner level up to dinghy race coaching standard, helping the club to increase its numbers on the water. The trained volunteers will also be able to utilise the internationally recognised RYA qualifications to gain a future career within the ever expanding sail training industry. By using trained volunteers the club is able to maintain low membership fees to ensure everyone has the opportunity to join, participate and train ensuring that financial considerations are not a barrier to sailing participation. The newly qualified dinghy instructors will be asked to commit to volunteer every Tuesday night during the sailing season when some 60 children will be offered ongoing tuition, from beginners through to race coaching, with the sailing equipment being provided by the club. Speaking at the presentation Luke Patience said “It’s fantastic to see Bart’s legacy in action here in Scotland. Bart was always keen to ensure that everyone had the chance to excel given the opportunity. This grant will not only provide employment opportunities for the volunteers but will provide the club with the resources they need to grow their vibrant youth section”. On behalf of Dalgety Bay Sailing Club Peter Taylor, Rear Commodore Training said “This grant will really help further the tremendous work our members and volunteers have been doing to promote sailing within the community and get more people safely on the water”.